Okay now, this is one mushy-mushy post! If you have two children, especially with one being a daughter, there is no dearth of kisses and hugs, seriously! My kids are always in a competition of who kisses and hugs the most. The beneficiary is ‘yours truly’ but at times it can have hilarious outcomes too. Most of the times I enjoy those free, no frills attached hugs and kisses, however, there are times when they just go overboard. It usually starts with one hugging or kissing me, then suddenly the other one decides to outdo the other and gives double the hug or kiss, eventually making me beg them to stop! Then there are times when the older one has hugged me and then she realizes that the younger one hasn’t so she murmurs into his ear that he should say ‘I love you Mama’ and hug me. The obedient sheep that my son is, he immediately sets about completing the task, only to realize that I am in the washroom. That’s when he will start calling out my name with urgency in his voice. I rush out only to find this guy leaning over the door and hugging me the moment I open the door. At times my daughter has this urge of showing off in front of her friends. She doesn’t need a reason for it, it could be anything – something sent in the Tiffin, her project that I helped with or some class that I have allowed her to join. 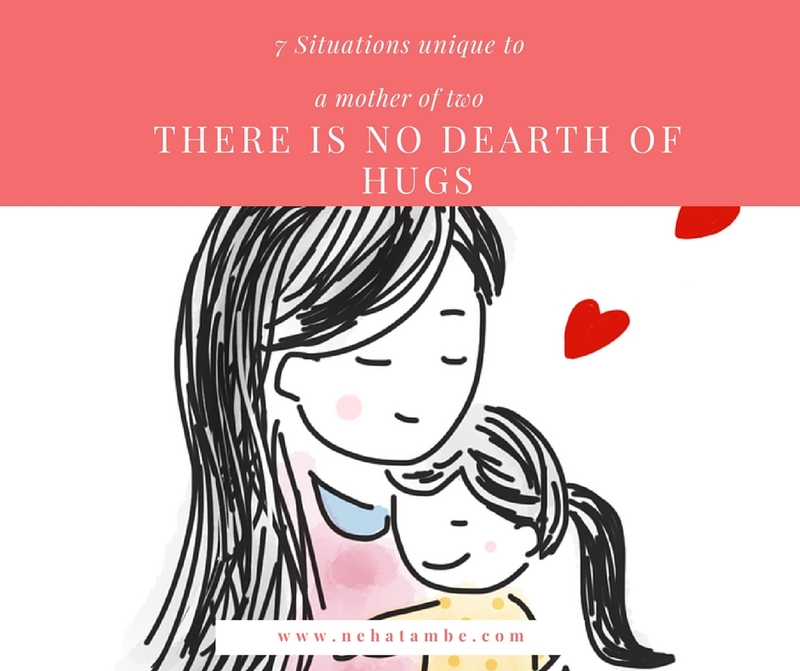 She will get out of the school bus and hug me saying ‘My mom did this and this, I love you momma’ and her friends will try and imitate her, thereby leading to a full blown hugging session at the bus stop, with all children hugging their mom’s. The fun part is because my daughter has done this in front of my son, though she may outgrow it in a year or two, my son will probably continue it for some more time, thereby making me a very happy Mom! Well my mom says that daughters become your BFF after a certain age! & it’s so true! This is a lovely post… and a lovely relationship that you need to get your kid to extend (blackmail her into hugs if she starts to grow too old for it 😀 ) and yes, its good that the son is seeing and learning from it too.